Blizzard isn't officially working on a console title, but Diablo III is a likely candidate if it does in the future. This generation's consoles have had big sales and are the current focus of many developers and publishers above the PC. Blizzard Entertainment is one of the world's most prominent exceptions to that rule thanks to its huge success with PC-exclusives like World of Warcraft and most recently StarCraft II. However, if Blizzard were to step into the console realm, it already has a game that it thinks would be the best fit. Blizzard's Jay Wilson told CVG that the game he's currently the director for, Diablo III, would likely be a good console title. He said: "I do agree that of all our titles, Diablo would be the easiest to bring over - mainly because of the controls." Blizzard Entertainment hasn't released a game on a console since the '90s, when it did titles such as The Lost Vikings and Blackthorne on the Super Nintendo (EDIT: Whoops, Diablo and Warcraft II were released on the PlayStation, though they weren't published by Blizzard. StarCraft was released for the N64, but also not handled by Blizzard). StarCraft: Ghost was the studio's last planned console game but it never made it to a retail release. A version of Diablo on consoles would certainly fit, as we've already seen similar titles like Sacred 2 on the Xbox 360 and PlayStation 3, and Baldur's Gate: Dark Alliance on the PlayStation 2, Xbox, and Gamecube. 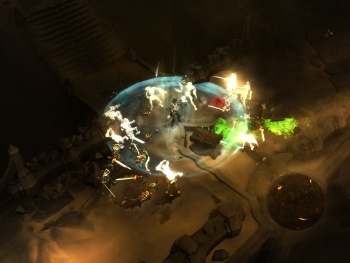 Diablo is the most popular of the hack-and-loot genre, so it seems it would not only work well on a console, but also sell a copy or two. Unfortunately, Wilson also reiterated that Blizzard has no plans to port Diablo yet, but that doesn't mean the topic hasn't come up. "I'd be lying if I said we never talk about it," he said. "But it's not something we're pursuing right now." Even though Wilson says Diablo's controls are most suited out of all of its series for a console port, the mouse-and-keyboard is still superior as I see it, so maybe this is why Blizzard chooses to focus on making the best PC experience possible. Adapting a PC-oriented control scheme to a gamepad never seems to feel right, and Blizzard sells plenty of games on the PC, so why bother watering it down?